The search function makes it simple for patrons to browse through AMI’s library containing millions of songs and thousands of music videos consisting of modern hits, timeless classics, and indie tracks. 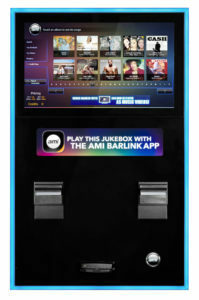 Customers can select music from their smartphones with the AMI BarLink app. Customize available music selections to you patrons’ music tastes. Block or limit selections with explicit lyrics or set your schedule to only allow playback during specified hours. HD videos provide additional revenue and make your jukebox impossible to ignore. Turn your NGX Ultra into an eye-catching billboard for your business to advertise drink specials and upcoming events with its built-in promotional features. Build custom promos to display on your jukebox with the AMI Ad Manager 2.0. Give your jukebox a bass boost with the optional Subwoofer Stand. 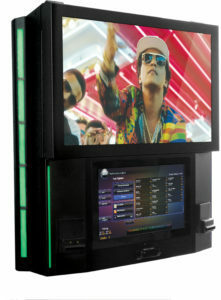 Tejas Vending can help your business utilize all the benefits of having an AMI Jukebox in your establishment.